Pass-through of login credentials will automatically use the currently logged in XTAM user account to also authenticate against the remote session. This provides the benefit of not having to define a specific shared account to be used with this record’s connection and it will also provide a more seamless login experience for your users. Also this pass-through credential option provides the benefit of being able to use your own login while auditing, recording and managing session access with workflows. Please keep in mind that the pass-through credentials feature will only work with endpoints that support a User and Password login. Create a new record or Edit an existing record that connects to a remote endpoint using a User and Password authentication method. For example, a Windows Host record type. In the User field, enter the value $forward or $login. Optionally, you may remove the Password value. Click the Save and Return button when finished. 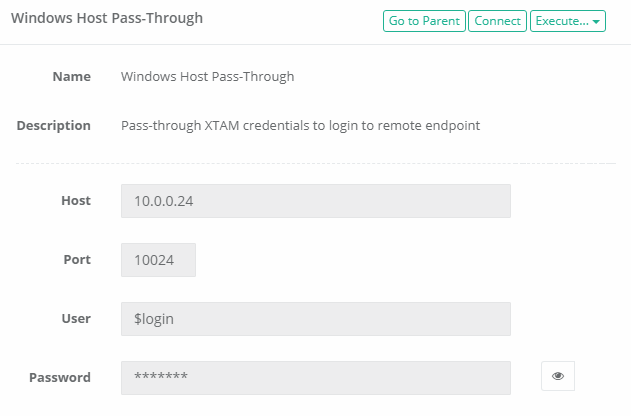 Now to test, simply login to XTAM with a user account that has the appropriate permissions on this endpoint and click the Connect button on its record. XTAM will pass-through the credentials used to login to it to the remote endpoint for session authentication. To confirm, you can open the record’s Audit Log and observe which account was passed through to the remote endpoint as shown below.